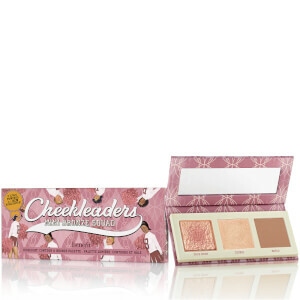 The benefit Cheekleaders Bronze Squad Palette is a limited edition cheek palette with five full size highlight, contour and bronzer powders to leave your complexion looking perfectly polished and defined. Housed in a mirrored palette complete with full size powder brush. A new golden pearl, super-silky highlighter to add shimmering luminosity to your finished makeup look. Treat your cheeks to a pop of colour with this coral-pink blusher. Complete with a soft, natural-bristle brush, the velvety cheek powder delivers a tropical flush that's perfect for all skin tones. A silky blush powder with a golden foil overspray. Ideal for all skin tones, the blusher sweeps on effortlessly to deliver a soft, subtle sheen with delicate flecks of golden pearl. Infused with the signature scent of Citrus, Vanilla and Sandalwood. A new medium-deep bronzer to for adding rich depth to the contours of your face. Lightly dust Hoola all over face, then sweep Hoola Caramel down sides of nose, beneath jawline and below cheekbones. Next, pop Gold Rush blush on apples of cheeks and Cookie highlighter on cheekbones. Cookie: Dimethicone, Mica, Alumina, Isododecane, Polyglyceryl-2 Triisostearate, Triethylhexanoin, Polyethylene, Magnesium Myristate, Phenoxyethanol, Caprylyl Glycol, Peg-12 Dimethicone, Tin Oxide. [+/-: Ci 15850 (Red 6, Red 7, Red 7 Lake), Ci 15985 (Yellow 6, Yellow 6 Lake), Ci 19140 (Yellow 5, Yellow 5 Lake), Ci 42090 (Blue 1 Lake), Ci 45410 (Red 27, Red 27 Lake, Red 28 Lake), Ci 73360 (Red 30, Red 30 Lake), Ci 77007 (Ultramarines), Ci 77163 (Bismuth Oxychloride), Ci 77288 (Chromium Oxide Greens), Ci 77289 (Chromium Hydroxide Green), Ci 77491, Ci 77492, Ci 77499 (Iron Oxides), Ci 77510 (Ferric Ferrocyanide, Ferric Ammonium Ferrocyanide), Ci 77742 (Manganese Violet), Ci 77891 (Titanium Dioxide)]. N° 13159/A. CORALista: Talc, Mica, Titanium Dioxide (Ci 77891), Polyethylene, Ethylhexyl Palmitate, Dimethicone, Zinc Stearate, Magnesium Myristate, Iron Oxides (Ci 77492), Phenoxyethanol, Boron Nitride, Sodium Dehydroacetate, Lecithin, Fragrance (Parfum), Red 7 Lake (Ci 15850), Aluminum Hydroxide (Ci 77002), Carmine (Ci 75470), Red 30 Lake (Ci 73360), Tocopheryl Acetate, Iron Oxides (Ci 77491), Manganese Violet (Ci 77742), Glycine Soja (Soybean) Oil, Tocopherol, BHT, Retinyl Palmitate, Limonene, Ultramarines (Ci 77007). N° 3n5563. Hoola: Talc, Iron Oxides (Ci77491-Ci77492-Ci77499), Zinc Stearate, Ethylhexyl Palmitate, Titanium Dioxide (Ci77891), Dimethicone, Manganese Violet (Ci77742), Methylparaben, Sodium Dehydroacetate, Boron Nitride, Propylparaben, Butylparaben. N° 3n5276-1. Hoola Caramel: Talc, Zinc Stearate, Ethylhexyl Palmitate, Dimethicone, Sodium Dehydroacetate, Boron Nitride, Phenoxyethanol, Caprylyl Glycol. [+/-: Ci 15850 (Red 6, Red 7, Red 7 Lake), Ci 15985 (Yellow 6, Yellow 6 Lake), Ci 19140 (Yellow 5, Yellow 5 Lake), Ci 42090 (Blue 1 Lake), Ci 45410 (Red 27, Red 27 Lake, Red 28 Lake), Ci 73360 (Red 30, Red 30 Lake), Ci 75470 (Carmine), Ci 77007 (Ultramarines), Ci 77163 (Bismuth Oxychloride), Ci 77288 (Chromium Oxide Greens), Ci 77289 (Chromium Hydroxide Green), Ci 77491, Ci 77492, Ci 77499 (Iron Oxides), Ci 77510 (Ferric Ferrocyanide, Ferric Ammonium Ferrocyanide), Ci 77742 (Manganese Violet), Ci 77891 (Titanium Dioxide)]. N° 13153/A.